Whether you're on stage, looking to impress at a costume party or just want to honor the classic mustache, a combination of spirit gum and crepe hair is the traditional way to fake facial fuzz. Sometimes, though, a trip to a costume or prop shop just isn't in the cards. 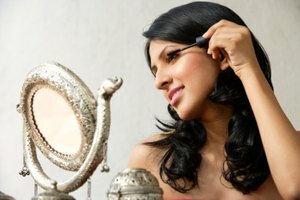 If you don't have the time, the genes or the desire to grow a mustache of your own, reach for the nearest makeup kit -- an eyebrow pencil, often used to touch up the real deal, is all you need. Rub a small dab of facial moisturizer into your upper lip. This will help to make the makeup application smoother and any excess eyebrow liner easier to remove. Select an eyebrow pencil that matches the color of your brows. Sharpen the pencil using the sharpener that came with it or a sharp-bladed, snug-fitting sharpener from an art supply store. A high-quality, sharp eyebrow pencil with a fine tip is key to faking a mustache as it enables you to make smooth, fine strokes that resemble individual hairs. Gently trace an outline for your desired mustache, making a sort of triangle that extends from the outer corners of your upper lip to the small indentation under your nose. The upper outline of your mustache should not touch the nose. Draw the mustache hairs line by line, using sharp, downward strokes from the top of the outline you drew to just above your upper lip. The lines should not be perfectly vertical, but should slant slightly outward instead. Be loose and quick with your movement, flicking your wrist with each stroke. This helps mimic the somewhat irregular growth of natural hair. Continue drawing the lines until you've filled in your makeup mustache. To make your mustache look even more real, touch it up with an eyebrow pencil one shade removed from the pencil you used for the mustache. Flicking a few more lines atop the base layer will simulate the natural color variations of human hair. In a pinch, you can apply liquid eyeliner with a fine-point makeup brush instead of using an eyebrow pencil. Health: Beauty Tips from Bobbi Brown: What's the Best Way to Sharpen an Eyebrow Pencil?